If this year's window displays in Florence are any indication, we will be seeing a lot thigh-high and knee-high socks and boots, more hats (yay! 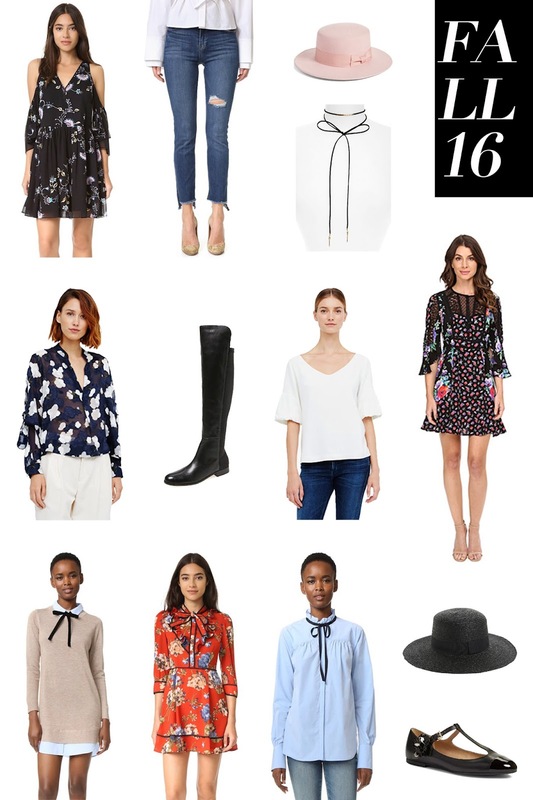 ), lots of chokers, more shoulder cut outs, voluminous sleeves, ruffles and bows, block heels, and lots of fall floral patterns -- all of which I love and plan on incorporating into my fall wardrobe. There are some trends that I will, of course, be rejecting. For example, slip on loafers (so impractical), 90s baby tees and bucket hats (just, no), and cropped flared/wide leg pants (universally unflattering). As much as I wanted to shop the Nordstrom Anniversary sale, it is hard an ocean away (don't worry I managed to pick up a few key items thanks to friends back home). I also have to remind myself that I live in Florida and if I begin purchasing fall items now, I won't be able to wear them for months. So, I have slowly been bookmarking items that reflect what's trending for fall, while still being wearable now.